It may still be a bit of an alien concept to many in this country, but ice hockey is one of the most exhilarating and action-packed sports in the world. At the highest level in America’s NHL (National Hockey League), there’re hard hits, fast skating, incredible skills and breath-taking goals… And yes, even the occasional punch-up! 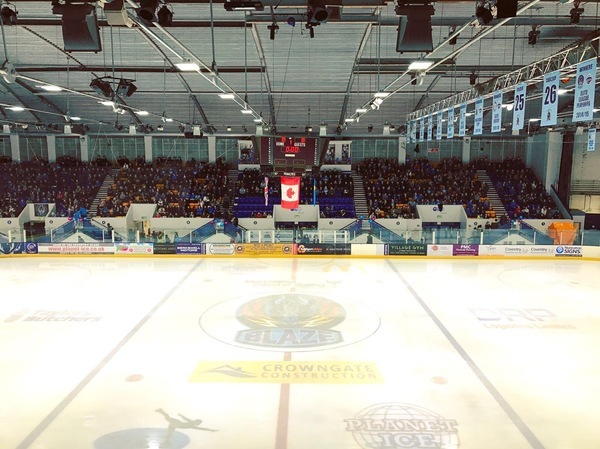 Because of this, the ice hockey has become a hot commodity to kick-off the Varsity weekend, with the game often selling out of tickets and students losing their voices by the end of the first period. As a life-long NHL fan, it was great to see the sport I love played so well at university level and I even took a pair of fellow UnCOVered bloggers to check out their first game and cheer on our athletes. If you’re a current student or you’re thinking about joining Coventry University, read on, this could be you this time next year. The teams make their entrances! Ice hockey is a really simple game at a base level. The game lasts for three periods of 20 minutes, with two teams of five skaters and one goalie on the ice at once. There are rolling substitutions taking place seamlessly throughout the game, as both teams try to get the disk-shaped puck into the opposition’s net. Each goal scored is one point and if you commit a foul, for instance tripping or elbowing, you’re looking at two minutes in the penalty box. This is known as a power play, as one team now has an extra player for these two minutes. As we walked into the Sky Dome, you could feel a real buzz of excitement in the air. There were students with their faces painted, the loud clacking of plastic thunder sticks and a real sense of team spirit and community. It was a joy to be a part of, no matter which university you were backing. 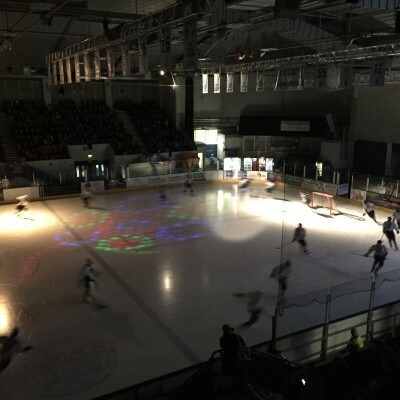 As the players skated out onto the ice for their big introductions, greeted by flashing disco-esque lights and the strains of an old rock song, you couldn’t help but feel this was something that really meant a lot. Coventry got off to a blistering start, scoring their first in just 14 seconds and didn’t let up for the rest of the match. To go 8-1 up at the end of the first period was an amazing feat. However, what impressed me the most was both teams desire not to call it a day after such a huge first 20 minutes. 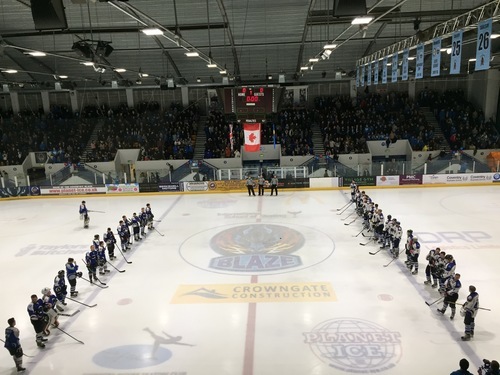 Coventry continued to press the action and Warwick fought on with great resilience, neither team allowing such a deficit to affect their sportsmanship throughout the game. All jibes and jeers from the fans were kept within the parameters of friendly competition too, it was all just for ‘the bants’. The final score turned out to be an 18-8 affair, respectable considering what Warwick were having to come back from. But what a night for Team Coventry! You come to expect some pomp and pageantry from sports that’re popular in North America, but what an entertaining show from start to finish. From the playing of the national anthem before the game to the between-period entertainment, attendees really got their monies worth. 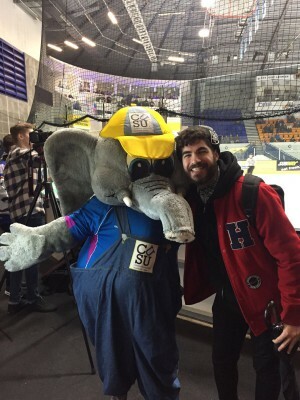 Our adorable mascot Tusky the elephant provided great support for Coventry throughout and was joined by the bear of Warwick and… a frog… Still not sure about that one. 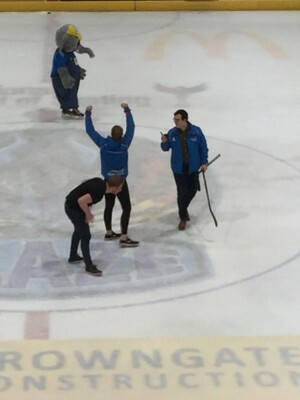 In another moment of victory, CUSU’s own Alexa took on the man known only as ‘Ted’ from Warwick in a shoot out from the half way line. Alexa picked up the win thanks to a perfectly placed shot that Ted just couldn’t answer. Great job Alexa! 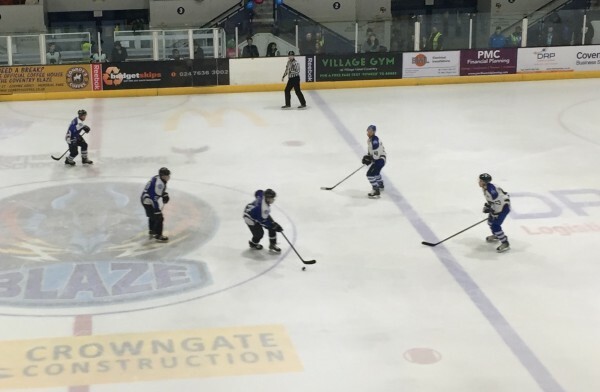 If you enjoyed the game and have gotten a taste for ice hockey, make sure you support our local team, Coventry Blaze! 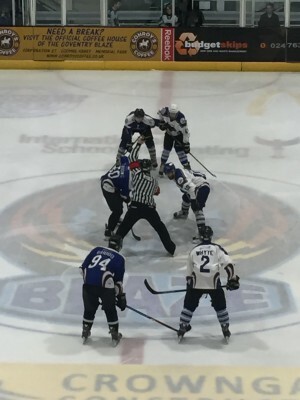 The Blaze play during the winter months and their season is nearly over, so catch their last home games before the break. It’s a really fun and different night out. If you can’t tell by now, not making it to this great sporting event was a real mistake! But don’t fret, Varsity is ongoing for the rest of the weekend with plenty more sports to enjoy. Please do your best to turn up, cheer loudly and support our dedicated and truly talented athletes! Let us know your Varsity highlights in the comments below! ← Want to Start a Postgrad Engineering Course This May?